I love the “In A Pikle” products, can I sell them? Absolutely! “In A Pikle” offers the opportunity to individuals and business entities to sell IAP product as an Independent Distributor. You are welcome to apply and ultimately be an “In A Pikle” Independent Distributor. An Independent Distributor simply purchases “In A Pikle” products in bulk at a large discount, and then they sell the product at Manufacturer’s Suggested “Retail” Price (MSRP) to their customers. The opportunity allows you to have control of your profit, set your own schedule, and create opportunities to sell IAP products. For additional information, please visit Agreement complete with Terms and Conditions. At this time there is not a monthly minimum or yearly quota to keep your account active. Please remember that we are not a Direct Sales company and therefore do not have teams with Uplines and Downlines. This frees you up to run your business the way that works best for you. You are invited to fill out the required application, and upon acceptance of the Agreement with Terms and Conditions your application will be reviewed. You should expect an account approval email that will include details and instructions on the next steps. **The application process can take up to 2 business days. Applicants will be notified by a personalized email from “In A Pikle” Customer Service when their account is active. Please contact Customer Service at customerservice@inapikle.com if you do not receive your Welcome email in two business days. Can anyone be an Independent Distributor? Yes! This opportunity is currently available for all (both individuals and business entities) to participate. The opportunity is being offered within the United States and in select international markets. As an Independent Distributor will there be a minimum purchase requirement? **Discount applies to MSRP and not Corporate sponsored sales, promotions and specials** | There currently is not a minimum purchase requirement to maintain an active Independent Distributor Account. Do you provide me with a personal website on which to sell? With out current “Independent Distributor” program you are solely responsible for creating a personal website to sell the product. As an “Independent Distributor” you are responsible for creating, maintaining, and any fees associated with a personal website, and ensuring that it fully complies with the https://www.inapikle.com/independent-distributor-agreement/. As an Independent Distributor, will there be products offered in bulk pricing? Yes! Various products, will be made available in bulk discount pricing. Items will appear in your catalog once logged in and will count toward your minimum order requirement for discount benefit to be applied. What, if any, “In A Pikle” Independent Distributor social support is provided? “In A Pikle,” by means of the Professional Facebook Group, supports and encourages professional camaraderie and sustained friendships within the “Pikle” professional community. The Professional Facebook Group is an online professional community “CLOSED” to only members, who can at this time submit admin approved posts for the purpose of uplifting, sharing ideas, praising and other positive and professional outreach. Please refer to the pinned post within the group for all guidelines. As the group grows so will changes begin taking place to keep true to its purpose. 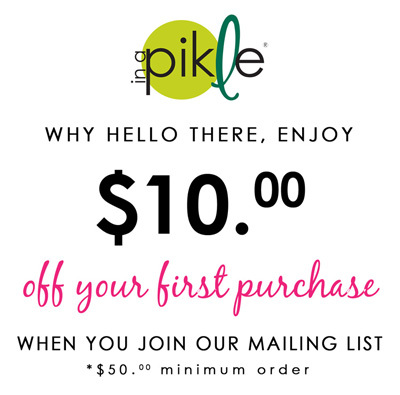 Will the Official Site of “In A Pikle” offer specials, promotions or sales? Yes. “In A Pikle” will host sales, promotions and specials on its official website as it deems necessary. At which time, Independent Distributors are welcome to purchase items at their discount, through their Distributor account, or purchase directly from the official site of IAP at the advertised discount, under a customer account. Will “In A Pikle” refer customers to Independent Distributors? Yes; when a customer reaches out to Customer Service regarding opportunities for Independent Distributors “In A Pikle” will refer them to local distributor(s) at its discretion. When does “In A Pikle” release new product? This will vary. We are always looking for new and creative ways to “Dill With It!” That’s where you can help us! Often product ideas come from our friends, family and loyal customers (you) and we recommend sharing any ideas customerservice@inapikle.com. How will taxes and shipping be assessed? Sales Tax will be collected at point of sale for UTAH shipping addresses only. Products shipped to any other state will not be charged sales tax at point of purchase. You will be responsible for remittance of all applicable sales tax according to your state requirements for any product that is resold. What marketing materials, if any, will “In A Pikle” provide? An Independent Distributor for “In A Pikle” will have access to the Visual Library, filled with professional images of the product and ideas. There will also be “In A Pikle” business supplies available through VistaPrint. How and where will I be able to sell my “In A Pikle” product as an Independent Distributor? *Please review all details regarding opportunities as well as restrictions in the Agreement complete with Terms and Conditions. The option to purchase marketing items through “In A Pikle’s” VistaPrint Store will continue to be available. It is prohibited to sell on auction and or online store sites such as Amazon, Ebay, Sears, DealDash, and other similar online market places. As a side note, reselling of IAP products is prohibited by ETSY’s own policies. I have additional questions, where can I go for answers? WE WANT TO HEAR FROM YOU! We invite you to reach out to our Customer Service department for questions and assistance in your business. Please direct all questions to customerservice@inapikle.com.